Master the Spanish verbs amar, temer, partir, ser, estar, dormir, ir, pedir, poder, haber, tener, jugar - with no memorization! Pronounce Spanish verbs the right way: The drills are narrated by a Spanish speaker and guaranteed to help you learn and practice correct pronunciation - as it is spoken today. Highly convenient and effective: Each drill is five to six minutes long and is very easy to do. You can listen to the drills practically anywhere - on your commute, while driving or running, or during any free time you have. Tenses that are barely used in actual speech are not included in the drills, so you can focus on the essentials. What did you love best about Spanish Verb Drills Mega Bundle? Growing up in a Spanish speaking household I had a small grasp on the Spanish language and tried to continue learning through free apps. Sadly, growing up I've lost most of my skills over time. 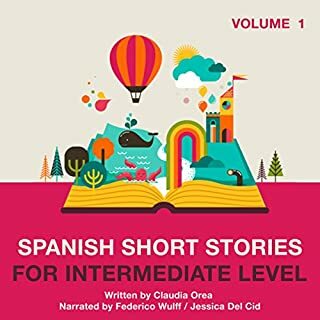 This audiobook is an amazing refresher for the Spanish language. Pronunciation and language mannerisms in the lessons are completely authentic and lie in sync with hearing native Spanish speakers like my grandparents. The coaching is so easy to follow and the difficulty is for the novice so it won't stress anyone out. The cognitive teaching strategy of drills is ideal for those of us who don't want to spend hours listening to stories and just want to learn the organic language. Lucia Bodas has the gift of teaching. Her clear assertive voice paired with her presentation of the lessons makes it effortless to follow along. Overall, I loved this audiobook! I thoroughly enjoyed this program. I found it to be very instructive and practical with no time wasted. This book was great. I took 3 years of Spanish in High School 12+ years ago and have been using Duolingo for the past year. But some stuff I still can't grasp too well. The one thing that I had the most trouble with is conjugation. This was perfect for that. I was able to listen to it on the way to and from work and I feel like I've got a good grasp on the concept now (a lot better then when I started it). I think the repetition and difference in speed helped a lot. By the end of the book I was having no issues perfecting the little quizzes in each lesson. 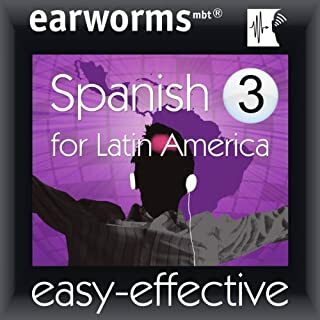 The audiobook is very good, it focuses a lot on the verbs and the correct pronunciation, I was struck by the fact that in many examples they teach you the differences between Spanish from Latin America and Spanish from Spain, although the differences are minimal, it is very good to learn them. I would recommend this audiobook. For those who are at least somewhat familiar with the language, this book is an excellent way to practice and differentiate the many forms of Spanish verbs. 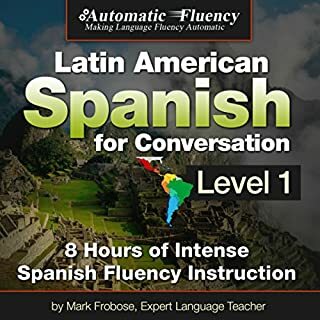 The instructor’s voice is clear, whether she is speaking slowly so that the listener may understand, or quickly as native Spanish speakers would. Her drills – both in the order she recites the verbs with the pronouns and in random order – are helpful so the listener is sure that they are not simply memorizing the words in order but actually learning the material. The translation of the verb being used is also helpful, and she also states whether or not the verb being used can be used for other -ar, -er, or -ir verbs, while hitting the most necessary irregular verbs. The only thing I was surprised to not hear was at least a quick translation of the pronouns; however, I suppose that this book is geared more towards those who are actively learning Spanish, and would know the pronouns already. It also may have been helpful to at least touch upon the uses of each verb form in English. It has been a long time since I have spoken Spanish, and I could not accurately remember exactly how each verb form is used. However, after spending time with this audiobook, I am pleasantly confident in conjugating Spanish verbs. This book is an excellent tool that allows the listener to gain proficiency through repetition. I had a difficult time with Spanish verb conjugation in the classroom and application through speaking, but listening to this book allowed me to catch on to the concept quickly and I improved. I would recommend this product to any Spanish student or those that want to become fluent in the language. This book is very practical! If you could sum up Spanish Verb Drills Mega Bundle in three words, what would they be? What other book might you compare Spanish Verb Drills Mega Bundle to and why? This is the only book of its kind that I have tried, so I cannot provide an answer to this question. I liked the book as a whole. I spaced out the book in multiple settings to fit with my schedule. 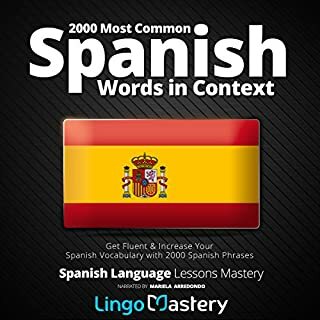 This audio book is especially useful for those who have already studied the Spanish language and want a good refresher on conjugate verbs. The narrator gives you time to repeat the words in different tenses, and the words are very clearly pronounced so it makes for easy repeating and memorizing. 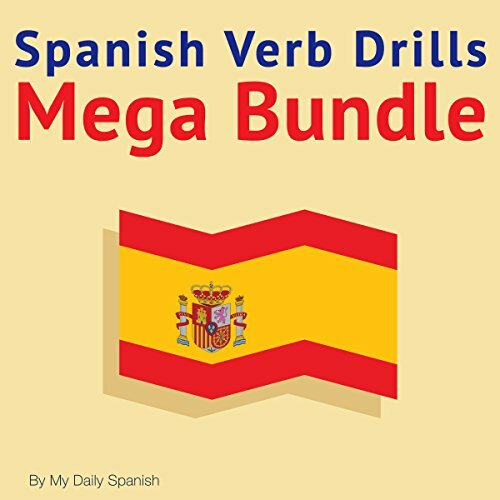 Would you listen to Spanish Verb Drills Mega Bundle again? Why? I found the methods used in Spanish Verb Drills Mega Bundle to be super useful. Following the lessons helped to make conjugation of verbs more natural and fluid. It helps build confidence in being able to speak and use the proper verbs. I especially like how it includes present, past and future tenses. The quizzes help to reinforce your learning and give you an opportunity to practice while the material is still fresh in your mind. I would definitely recommend it! The book is a pretty good review of how to conjugate basic Spanish verbs. The list of verbs covered by the book are pretty much the basic forms that anyone interested in studying Spanish has to master. I liked how archaic tenses were not covered as they do not come up in daily speech. The drills are pretty helpful and enough time is given for you to repeat after the speaker. One knock on this would be that the speaker's English isn't as good as it could be, but it doesn't affect the listener's ability to comprehend what is being said. The method used to remember the phrases is unique. The increased speed is a bonus to the challenge of repetition that's used! Would you consider the audio edition of Spanish Verb Drills Mega Bundle to be better than the print version? What was one of the most memorable moments of Spanish Verb Drills Mega Bundle? Have you listened to any of Lucia Bodas’s other performances before? How does this one compare? What disappointed you about Spanish Verb Drills Mega Bundle? Has Spanish Verb Drills Mega Bundle put you off other books in this genre? Very expensive considering you get no additional information, a 3 minute clip at the beginnnig of the book is not enough to showcase the book. As a native Spanish speaker, it was very good. Sometimes she changes the order of the pronouns before the quizzes. Another thing is many verbs can have different ways of being translated, like the verb “to leave”, which is translated as “salir” and less commonly known as “partir”, which actually means “to break”. In the audiobook, she translated “partir”, which actually means “to break”, as “to leave”, which is not wrong, but it is incorrect. But of course, everything depends on the context. The way she teaches the verbs is great. Moreover, I enjoyed a lot the quizzes, they are very helpful to learn the verbs. Did Lucia Bodas do a good job differentiating each of the characters? How? Yes, she did. She explained it very well, but in some occasions she does not tell the listener when she uses the negative form, which can get sometimes confusing. Moreover, Lucia Bodas has a slight different pronunciation from normal Spaniards, as she is from South America, where they have another way of pronouncing verbs and words in general, a bit different from native Spanish speakers. 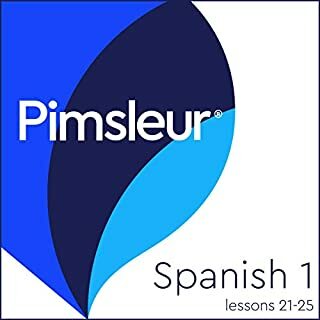 Was Spanish Verb Drills Mega Bundle worth the listening time? 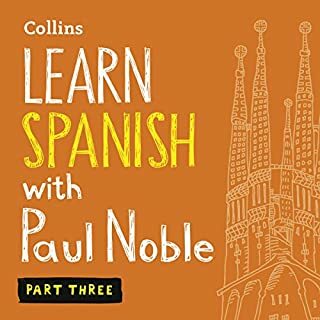 Yes it was, but obviously you cannot learn all the Spanish verbs from this audiobook, as well as the colloquial forms, irregular and reflexive verbs. I have been speaking and learning Spanish since I was three years old, as I am living in Spain, hence, learning the verbs is very easy for me. In my opinion, Spanish verbs are more diverse than the English ones, as there are more verb tenses, irregular verbs, reflexive verbs and more, which can be very tricky. I must say that this audiobook is good, even tough I already knew these verbs, and I would recommend it for anybody who would like to learn some basics of the Spanish verbs. What impressed me most about this audiobook, was the level of contact you receive with a native speaker, which I found really helpful and a great boost to my confidence. The audiobook is also incredibly thorough, working through several different verb forms and the audio itself is very high quality. Would recommend! It literally is lists of conjugated verbs (yo/tu/el/ella/nos/nos/vos/vos/ellos/ellas) (excuse missing accents), which you can either repeat or anticipate, or both. If you learn by repetition, this will help. Starts with AMAR (reg AR verb model) in the present; repeats with slight variations (making it a question, adding 'not', shuffling the order of the pronouns; then moves on the imperfect and does the same drills, then preterite and same drills again... and so on. Each section is a short chapter so is easy to find / skip. Beautifully pronounced, so it is easy to copy the stresses. The order is odd: I expected AMAR to be followed with a regular ER verb but got DORMIR, but that's OK. No sentences so it's not for listening/translation skills but if you concentrate (mostly) you will likely start to skip some chapters before long coz you will absolutely know how to conjugate the verbs. Hurrah! I feel that the Drill method used works well to establish Spanish Verbs in your memory. 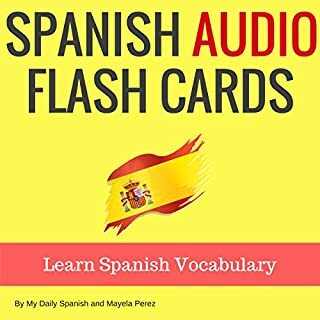 This audiobook covers a large amount of basic verbs and helps greatly with your Spanish pronunciation. The book is split into manageable sections and has a fairly simple structure. I found it easy to follow and the audio quality was extremely clear. I would recommend this audio book to anyone with a basic understanding of the language looking to improve their accent and confidence in speaking the language. A precise tool designed for a specific purpose. Very simple; lacking in formal structure but good for learning verb forms. It's like an MFL vocab class, looking at conjugations of various verbs for differing pronouns and tenses. This will not teach you Spanish but it is very good reference for verb forms, which can be very tricky from the view of a native English speaker, as we don't conjugate in such a concrete fashion. They're nice short chapters of about 4 mins each. The narrator slowly took me through each form for each verb, then faster (to match what you'd hear in conversation). You then have a chance to repeat in order and then complete a mix-match so you can test understanding. I found the accent a bit different to other audio materials I've used. The narrator announces that she's using a South American accent so it might be different for those using Castellano. I find hearing the stresses much easier and it's something I could easily return to several times. I would recommend this to those who already have some solid Spanish vocabulary, i.e. the root verbs, and need to start learning conjugations. It is a precise tool designed for one specific purpose with a clear native speaker and encouraging interaction. 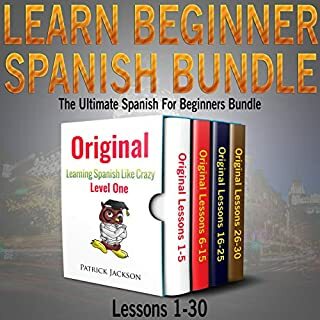 Spanish verb drills bundle is a great way to learn basics. It focuses on learning by repeating, and how better can you learn how to speak a certain language if not by talking? Simple, yet impressive. I really loved this audiobook and the way is structured. For each verb there is a listening part: really clear, at a nice and slow pace at first, then a little faster. My favourite part was the game; you have to match the pronoun with the right conjugation. This little game really made the experience much more enjoyable and fun and it made it easier to remember the verbs. 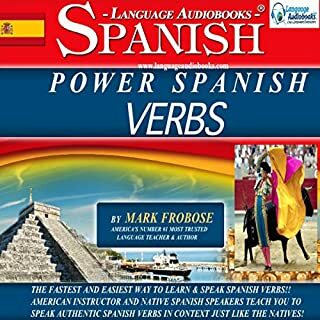 I have studied Spanish for 6 years and I am at a conversational level but verbs were my weakness... well not anymore, thanks to this audiobook now the right verbs come to mind easily and naturally. I would totally recommend it to anybody interested in Spanish.. Though iTunes doesn't seem able to navigate through the chapters of this audiobook (so I'm not really able to use it effectively in my practice), it seems like a very useful resource. I can access it online instead. The pronunciation is clear and authentic, and the memorization/random order/quiz format is effective. A huge number of verbs are conjugated in a number of different ways. I appreciate that the best way of internalising conjugations is to work on them in bulk - this audiobook seems to do just that. 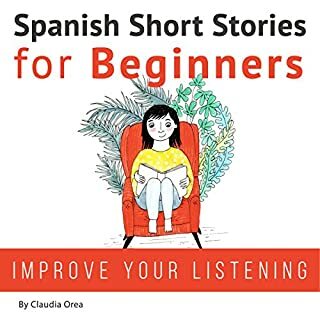 I'd like it if the audiobook included a short dictionary-type translation for each verb - as a beginner I've enjoyed researching these elsewhere but it'd be fun if one were included in this book, perhaps in Spanish, and English afterwards? 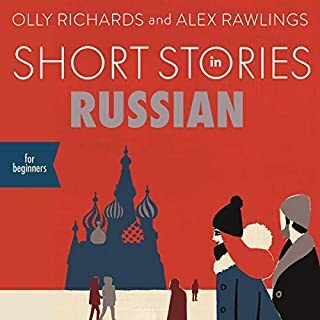 Apart from the problem navigating the chapters (the only way seems to be to use the playhead scrubber in iTunes and guessing the timestamp), I'd really recommend using an audiobook resource just like this one - it's helped me out already!